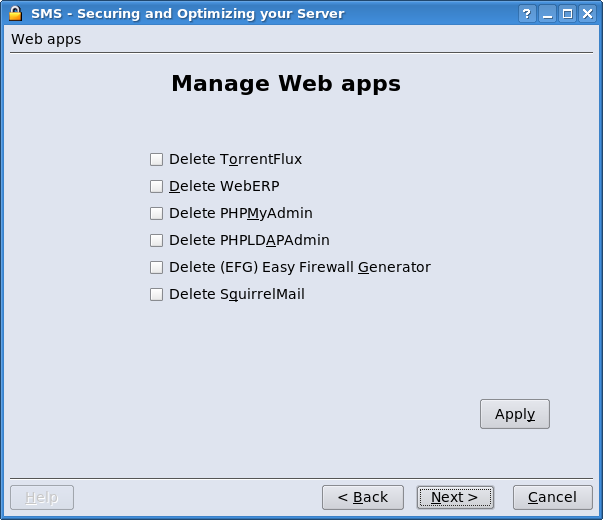 SMS now has a GUI through sms_config kmdr tools to secure and optimize your server. 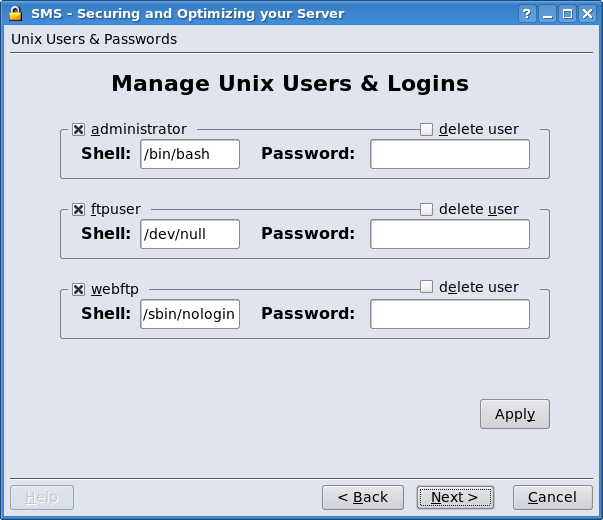 The GUI intended for clean installations of SMS with default passwords, although some part or all might work in older installations. /usr/share/applications/sms_secure.kmdr is a part of sms_config.kmdr shortcut available in root's Desktop. Here you can alter all password and shells at once or individual for default users. Assuming you already add password for root during installation, they are users administrator and two ftp users, webftp and ftpuser. By checking the box "delete user" and pressing apply you delete the user(s). If you don't want to alter anything click next. 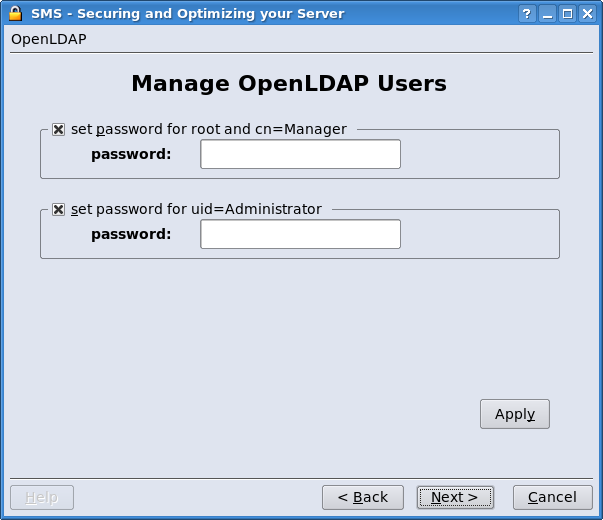 Here you can change passwords for openldap's root and cn=Manager which should be the same. The method used to change password for root is the same as resetting the password so it should work for older installations too. Here you can change mysql's root password and alter default database passwords for sqlgrey, weberp and torrentflux. weberp and sqlgrey are by default disabled, unless database passwords are the defaults so they will be enabled. Changing passwords for weberp and sqlgrey update their configs too with new password. Torrentflux's database by default runs by root, so by selecting a password, the wizard, create a user and grant privileges to him for torrentflux database, and update it's configuration. 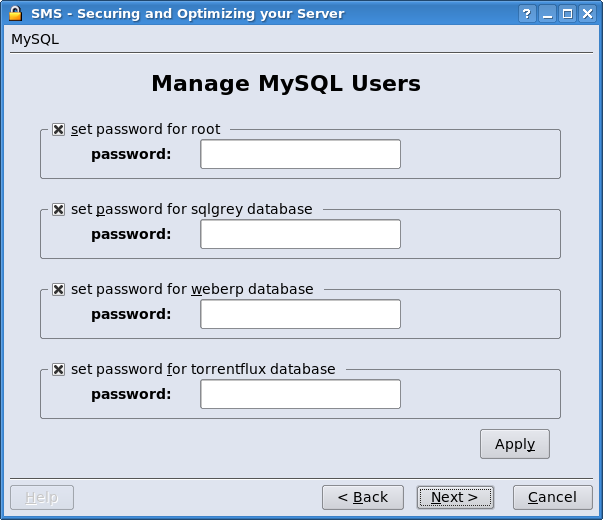 Changing mysql's root password is mandatory, for altering weberp,sqlgrey and torrentflux databases, as it uses the new mysql's root password. The method for changing mysql's root password is the same as resetting so it should work in older installations too. If you don't intend to use weberp or torrentflux unchecked them, and later in the wizard, you will be prompt to delete them. 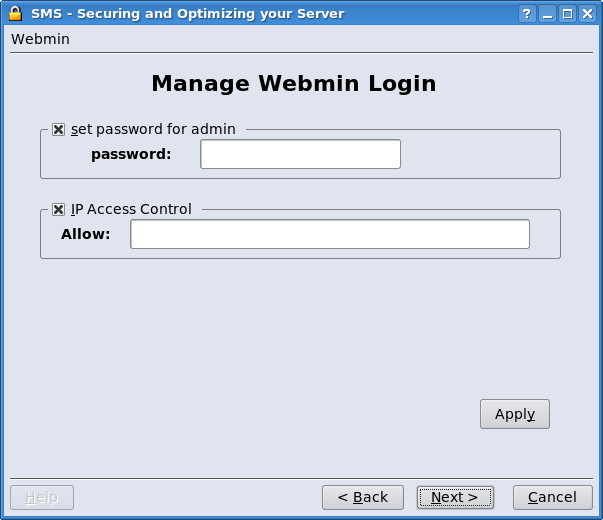 Here you can change password for default Webmin admin and restrict service to private network. The method for changing the password is the same as resetting. Script only look for user admin, so if have added other administrators use sms_tools for changing their passwords. If you intend to not use webERP or Torrentflux check them and click apply to delete their directories and mysql databases. Here you can limit access of samba shares to your private network only, by default samba listen to all subnets. This is intend to work in clean installations only or if default smb.conf is present. CUPS is also listen to all subnets by default (Allow All), this will work only if default cupsd.conf is present. Here you can manage which services you want to start at boot (chmod (-+)x rc.script). Dovecot, postfix, cyrus-sasl, spamassassin, mailscanner, sqlgrey and clamav are part of Mail service. Clamav has an option of it's own, if you intend to use it with samba. Even if you enable some services, such as NFS or TightVNC if they aren't configured they will not run. Also by disabling hylafax you will delete all hylafax cron jobs, so if you want to enable it later on, you will have to reinstall the package. Well you don't have to do anything here, unless you want to go back. Just click finish and reboot your server. If you experience any issues, or you found a bug, let me know. A similar wizard is available in smsconfig by entering "smsconfig secure"